The Port of Seattle celebrated the start of its twentieth cruise season earlier this week with the arrival of Celebrity Eclipse at the Bell Street Pier Cruise Terminal at Pier 66. This year promises to be a record-breaking year. The port estimates 1,208,590 passengers will pass through the port this year on cruises, breaking last year's record by more than 93 thousand. The complete story appeared in the April 19 edition of Cruise News Daily. 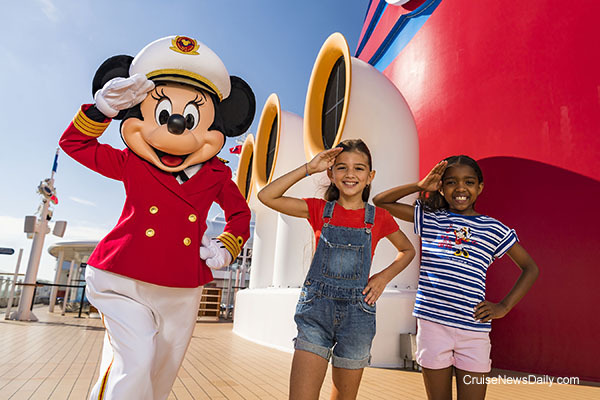 Somewhere along the line recently aboard Disney Cruise Line, Minnie has received her fourth stripe, because she's now Captain Minnie Mouse, and encouraging girls to be like her and pursue maritime careers aboard the Disney ships. Disney is counting on the power of the Mouse - Minnie Mouse - to do it. The complete story appears in the April 18 edition of Cruise News Daily. Photo courtesy of Disney Cruise Line. All rights reserved. Photo may not be copied or used without express permission. An update on the situation with cruises to Cuba with relation to the latest Trump administration announcement. Details appeared in the April 18 issue of Cruise News Daily. Details regarding travel are still not clear, but an announcement by the Trump administration on Wednesday said they were imposing restrictions on trade with Cuba which, among other things, would limit travel. The announcement in separate speeches by both Secretary of State Mike Pompeo and National Security Advisor John Bolton did not specifically mention cruises, but from what was said, it seems passengers on cruises are definitely the type of tourism they want to prohibit. It was enough of an indication that the stock of all three major US-based cruise companies closed down slightly on Wednesday. All, though, have said in the past that cruises to Cuba are a small part of their total business. The complete story appeared in the April 17 issue of Cruise News Daily. Details appeared in the April 17 edition of Cruise News Daily.